The polyteron rectates are split up into three categories (sort of like the 4-D cases), two of the regiments are quite large, so they have their own categories (category 4 for the rat regiment, and category 5 for the nit regiment), all others are here. This category includes the duorectate regiment (dot regiment) as well. There are 3 regiments here - rix (oooxo) with 7 members, dot (ooxoo) with 5 members, and rin (ooox'o) with 11 members. 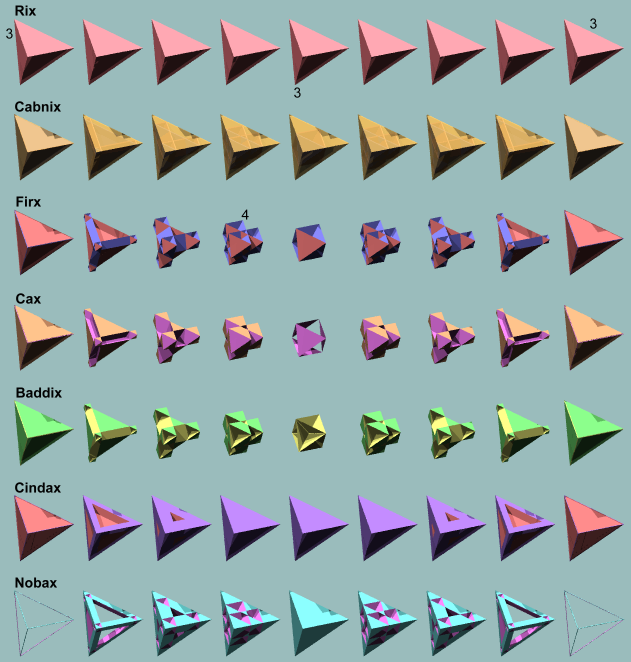 Rix is the rectified hexateron, its members all have hixic symmetry with 15 vertices. The tame ones are rix, firx, cax, and baddix - the others are wild. 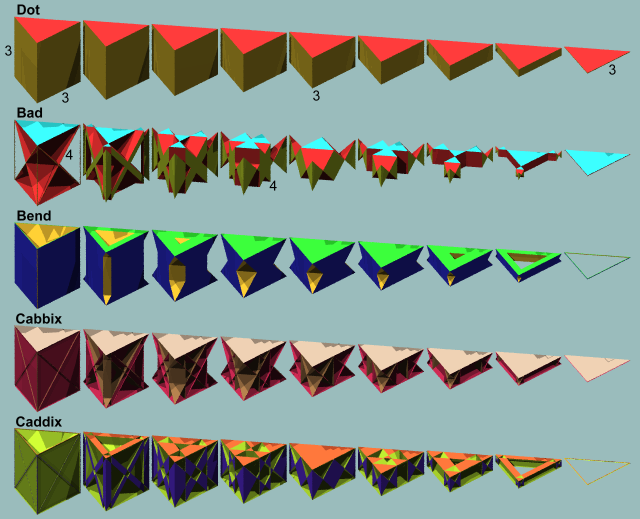 Above are the verfs as a series of cross sections. 25. Rix - rectified hexateron. The symbol is oooxo. It has 6 raps and 6 pens. Its verf is a tepe. This is the 5-D version of rap. 26. Cabnix - (CAB nix) cellibiprismatointercepted hexateron. This is the 5-D version of pinnip. It has 6 raps, 15 tepes, and 10 triddips. Its verf is a inverted tet prism. 27. Firx - (FIRKS) facetorectified hexateron. This polychoron is the 5-D version of firp, it has 6 pens, 15 tepes, and 10 triddips. Its verf is tet retroprism. 28. Cax - (CAKS) cellihexateron. It has 6 firps and 15 tepes. Its verf is a 3/2 antiprism walled faceting of tepe. 29. Baddix - (BAD dix) biprismatodishexateron. It has 6 firps, 6 pens, and 10 triddips. Its verf is a 3/2 antiprism walled faceting of tepe. 30. Cindax - (SIN dax) cellintercepted dishexateron. It has 6 pinnips, 6 pens, and 15 tepes. 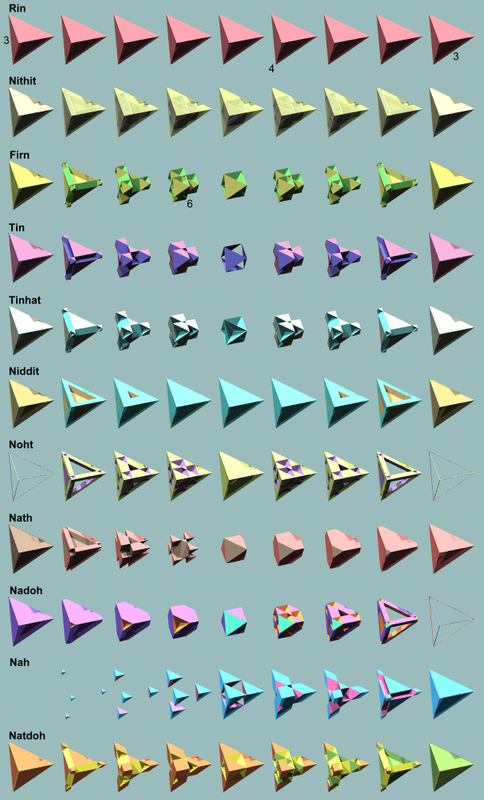 Its verf a pinnip-verf walled faceting of tepe. 31. Nobax - (NO bax) spinobiprismatohexateron. It has 6 pinnips and 10 triddips. Its verf is a pinnip-verf walled faceting of tepe. Below are fields of sections of each member of the rix regiment in same order. Then there's a larger pic with a sample section of each. Dot is the bitruncated hexateron - or better yet - the dodecateron. All of these have 20 vertices. Dot is tame, bad is feral, the other three are wild. Verfs are above in sections. 32. Dot - dodecateron. This polychoron is like deca in some ways, but it isn't the 5-D version of it - but in some ways it is a 5-D version of oct. Its symbol is ooxoo. It has 12 raps. Its verf is a triddip. 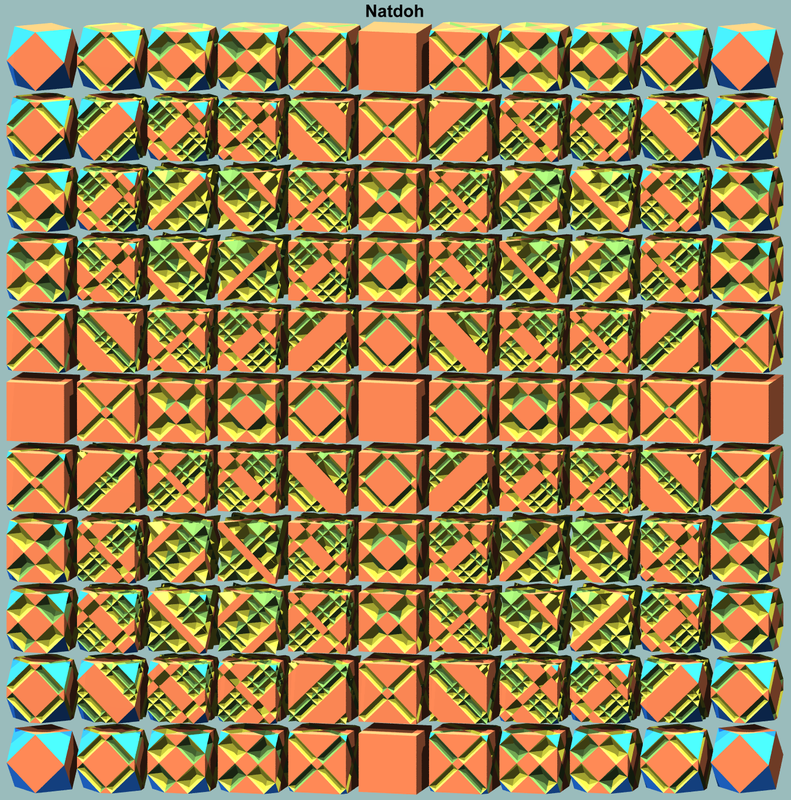 It has dottic (dodecateron) symmetry. 34. Bend - biprismatointercepted dodecateron. It has 12 pinnips and 20 triddips. Its verf is a triddip faceting with pinnip verfs instead of trips. It has dottic symmetry. 35. Cabbix - (CAB bix) cellibiprismatohexateron. It has 6 raps, 15 opes, and 20 triddips. Its verf is a faceting of triddip with half of the trips. 36. Caddix - (CAD dix) cellidishexateron. It has 6 firps, 6 pinnips, and 15 opes. 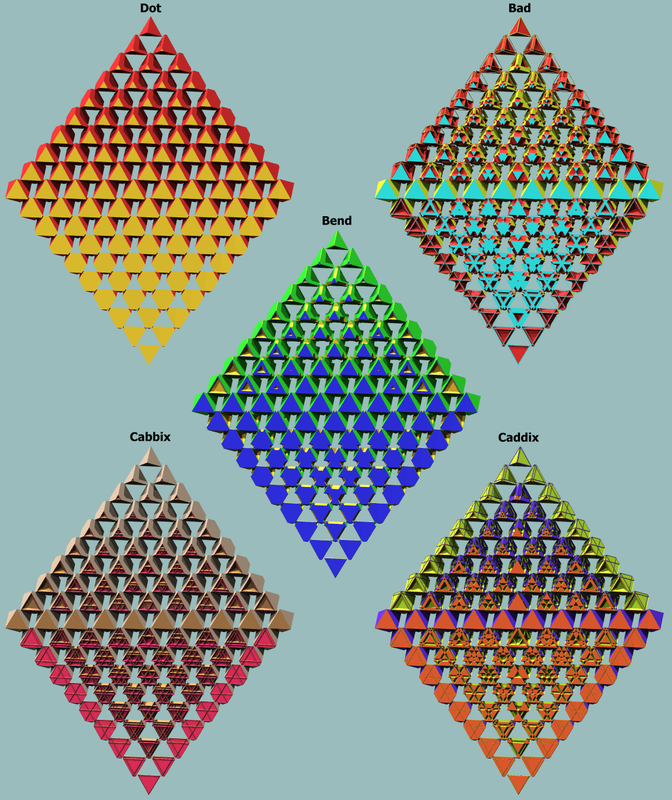 Its verf is a faceting of triddip with 3 firp verfs and 3 pinnip verfs. Below are fields of sections of each member of the dot regiment in same order. Then there's a larger pic with a sample section of each. Rin is the rectified penteract, these polytera all have 80 vertices. The first 7 have pentic symmetry, the last 4 have hinnic symmetry. The tame ones are rin, firn, tin, and tinhat - others are wild. The verfs are above. 37. Rin - rectified penteract. Its symbol is ooox'o = oooX. It has 10 rits and 32 pens. Its verf is a long tepe. This is the 5-D version of co and rit. 38. Nithit - (NITH it) penteracti32hemi32. It has 10 rits, 32 tips, and 16 decas (which go through the center and are hidden also). Its verf is a long inverted tepe. This is the 5-D version of hinnit. 39. Firn - facetorectified penteract. It has 32 pens, 32 tips, and 16 decas. Its verf is a long tet retroprism. This is the 5-D version of firt. 40. Tin - 32penteract. It has 10 firts and 32 tips. Its verf is a 3/2 antiprism walled tepe faceting. 41. Tinhat - (TIN hat) 32intercepted hemi32. It has 10 firts, 32 pens, and 16 decas. Its verf is a 3/2 antiprism walled tepe faceting. 42. Niddit - (NID dit) penteractidis32. It has 10 hinnits, 32 pens, and 32 tips. Its verf is an inverted trip walled tepe faceting. 43. Noht - (NOTE) penteractihemi32. It has 10 hinnits and 16 decas. Its verf is an inverted trip walled tepe faceting. 44. Nath - penteracti32-16. It has 10 stoes, 32 pens, and 16 tips. Its verf is a capped faceting of tepe with sto-verf walls. This is the 5-D version of sto. 45. Nadoh - (NAY doh) penteractidis16. It has 10 stoes, 16 decas, and 16 tips. Its verf is a faceting of tepe with sto-verf walls. 46. Nah - penteracti16. It has 10 gottoes and 16 tips. Its verf is a spiky tepe faceting with gotto-verf walls. This is the 5-D version of gotto. 47. Natdoh - (NAT doh) penteracti32dis16. It has 10 gottoes, 32 pens, 16 tips, and 16 decas. Its verf is a capped tepe faceting with gotto-verf walls. This one is cool looking! Below are fields of sections of each member of the rin regiment in same order. Then there's a larger pic with a sample section of each. Below shows how the rectates pair up as conjugates. The following are self conjugates: all. The following are conjugate pairs: none.